See the sites of Miami from the water on this guided, 1-hour Jet Ski tour along Biscayne Bay. Travel the crystal clear waters of Biscayne Bay and enjoy the view of Miami’s breathtaking waterfront. See the sun-splashed downtown Miami skyline, the mansions of the rich and famous, the Venetian Islands, the Port of Miami, Miami Beach and much more. Along the way, look for dolphins, manta rays, sea turtles, manatees and other ocean wildlife. A variety of departure times are available throughout the day to fit into almost any schedule. Une heure pour avoir les jets, car ils s’occupe de tout sauf des clients. Les jets pas vraiment en bon état. Et ils interdisent de prendre des photos car ils veulent le fAire et les vendre. Du coup, une fois que vous avez dit non merci, le gars ne s’occupe plus de vous durant la balade. Expérience décevante dans la ligne des pièges à touristes. 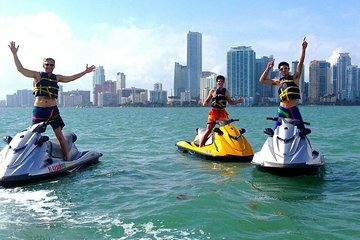 Really great experience to go along the Miami Skyline / Miami South beach by jetski. The tour is very flexible and the tour guide adjust like you want. For 20 USD extra you also receive pictures per E-Mail. This was an amazing experience. Jay, our tour guide was fantastic. He was friendly, informative and attentive. He sold the whole experience and because of the great service and exceptional guide, I would highly recommend this company and tour.